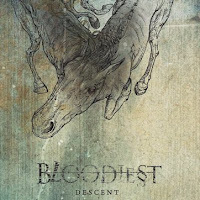 Bloodiest’s Descent takes the form of a progressive, artrock journey, attempting to create soundscapes enveloped in a cinematic nature, to hard chuggy metal. They’re a seven piece based in Chicago, that illicitly use all sorts of quasi layering with the guitars and keys to make up the perceived scape. Perceived because most of the time you can only hear two guitars, drums, some keys and a reverberated vocal on playback, which is a complete mishap for a band earthed in the idea of atmosphere. It relies on what’s going on within its meandering background, and if that’s not present – which it isn’t – then the entire wall of sound whimsically crumbles, or ceases to exist. It renders the record a moot flat. 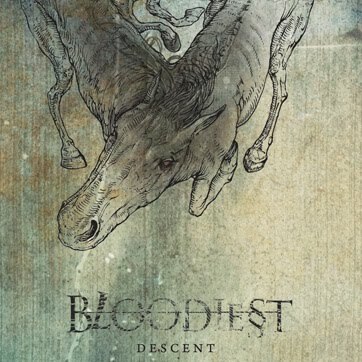 Musically Bloodiest is incredibly artistic and portentous. It fleets quietly and usually ends up crashing and banging, with the occasional amount of metallic edge. This is an album which dances and dances and dances around the point, and when they get there, it’s unfortunately difficult to give a hoot.